(01.04.2010) War Resisters’ International learned today that Turkish conscientious objector Enver Aydemir has been sentenced to ten months imprisonment by an Eskişehir court on Tuesday, on charges of desertion. Enver Aydemir refuses military service based on his religious beliefs as a Muslim. He refuses to be part of a secularist military. Enver Aydemir was first called up to serve in a gendarmerie unit in the north-western Turkish province of Bilecik. He was brought to his unit by force. After declaring his conscientious objection, Enver Aydemir was arrested on 24 July 2007, and sent to Eskişehir military prison, where he spent several months in pre-trial detention. On 4 October 2007, he was released by the court, and ordered to again report to his unit in Bilecik. However, Enver Aydemir did not follow this order. He was again arrested on 24 December 2009, and after several days again transferred to the military prison in Eskişehir (see co-alerts, 29 December 2009 and 30 December 2009). While in prison, he faced further disciplinary punishment for refusing to wear the prison uniform and disobeying order. 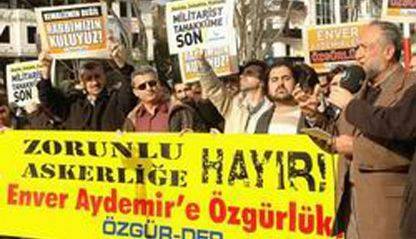 On 30 March, the Eskişehir military court sentenced Enver Aydemir to 10 months in prison on charges of desertion. Given the time he had already spent in prison, he was then formally released, but is now being taken to the Bilecik 2nd Gendarmerie Private Education Unit, where he will be ordered again to complete his military service. If he refuses, he will again be arrested and transferred to Eskişehir military prison, to await a new trial on charges of disobeying orders - the begin of a vicious cycle. Turkey not only does not recognise the right to conscientious objection, as enshrined in Article 9 of the European Convention on Human Rights (ECHR) and Article 18 of the International Covenant on Civil and Political Rights (ICCPR), it also repeatedly imprisons conscientious objectors, in violation of Article 14 ICCPR. The United Nations Working Group on Arbitrary Detention noted in its Opinion No. 16/2008 on the case of Turkish conscientious objector Halil Savda that "the Working Group, on previous occasions, has already declared arbitrary the detention of conscientious objectors following a second conviction on the grounds that this would be tantamount to compelling a person to change his or her convictions and beliefs for fear of not being subjected to criminal prosecution for the rest of one’s life, being incompatible with the principle of double jeopardy or ne bis in idem, thus violating article 14, paragraph 7 of the ICCPR, and falling into category III". And: "In the view of the Working Group, it has been established that the limitations on Mr. Savda’s right to freedom of religion or belief as a genuine conscientious objector is not justified in the present case, and is, thus, in violation of article 18 of the Universal Declaration of Human Rights and of article 18, paragraph 1 of the ICCPR. Accordingly, the criminal prosecution, sentencing and deprivation of liberty of Mr. Savda for holding and manifesting his belief and conscience is arbitrary in terms of category II of the Working Group’s categories". Consequently, the sentencing and imprisonment of Enver Aydemir also constitutes arbitrary detention. War Resisters’ International calls for letters of protest to the Turkish authorities, and Turkish embassies abroad. Presidency of the Turkish Republic: Fax +90-312-4271330, email cumhurbaskanligi(at)tccb.gov.tr. A protest email to the Turkish President Abdullah Gül can be sent at http://wri-irg.org/node/9859. War Resisters’ International calls for the immediate release of Enver Aydemir and all other imprisoned conscientious objectors. (11.06.2010) Bianet: Türkei: Kriegsdienstverweigerer Aydemir freigelassen! - 15 Monate Militärdienst oder drei Jahre Folter! (10.06.2010) Bianet: Turkey: Conscientious Objector Aydemir Free! - 15 Months of Military Service or 3 Years of Torture! Copyright if not stated otherwise: © Connection e.V.